When I was planning my trip home to Massachusetts a few weeks ago my sister-in-law texted me "I'm taking you somewhere you will love. Ocean House. Sound good?" "Yes, sure. It's called Ocean House. Yes." And so on a hot summer's day, my sister-in-law Sue and her girls, Mia and Tita and I donned our most preppy and ladylike frocks and took a drive to the grand Ocean House. Oh, the Ocean House. Ocean House is beachy posh. Your Ocean House experience begins when you pull into the drive of the grand pale yellow hotel. The valets who take your car look like the well-heeled boys you went to college with. I imagine right about now some of them just might be headed back to Boston and New Haven as school begins. There is a croquet lawn to your right, of course, that's easy to imagine must hold the most lovely weddings with the Rhode Island coastline as a backdrop. One of the wonderful (and charming) things about Ocean House is the rich history of the hotel. This grand Victorian hotel first opened as a beach resort in 1868 just after the Civil War. 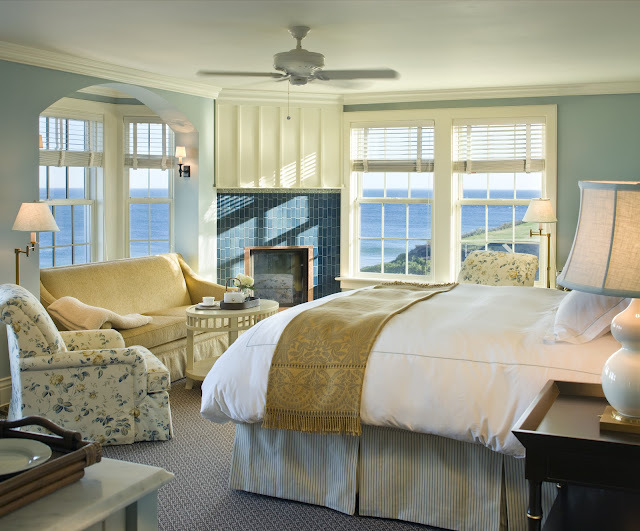 The original hotel closed in 2003 and Ocean House underwent a $146 million remodel using over 5,000 salvageable artifacts from the original structure including a stone fireplace that was taken apart stone by stone and carefully rebuilt. You can see this extraordinary stonework today in the lobby. The new resort is now open year-round and features 49 rooms and 23 private residences (versus the original 159 rooms) decorated in beach friendly colors of butter yellow, cream and cornflower blue. All rooms feature water views and many offer fireplaces. While guests may feel pampered with the plush robes and towels, attention was also paid to the technology part of your visit with HD LCD flat panel televisions, iPod docking stations and state-of-the-art sensory technology alerts for all your housekeeping needs. And in case you were wondering, yes, each guest room as a dedicated floor valet for butler service. Want a piece of Ocean House for your very own? by leaving a comment here. Entries must be received by October 31, 2012. In Seasons restaurant (with unimaginably extraordinary panoramic views), we enjoyed the most wonderful lunch. 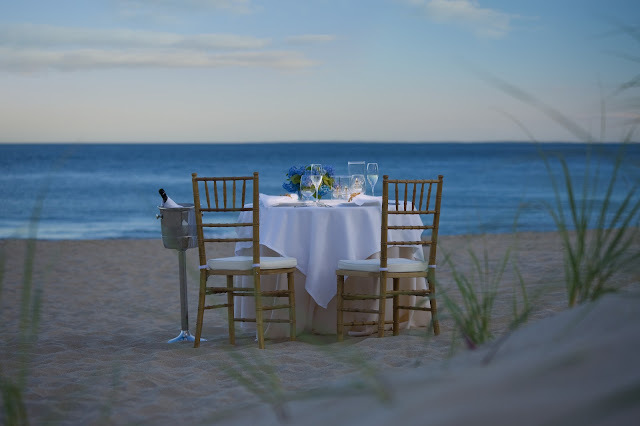 We were especially impressed with Seasons' philosophy using farm-to-table cuisine including local, estate-grown ingredients from the resort's own farm as well as sustainable produce and the ethical use of the sea. Sue and I ordered iced tea and the girls loved the presentation which included sugar cane sticks which was a nice touch along with the lemon and ice cubes made from tea. 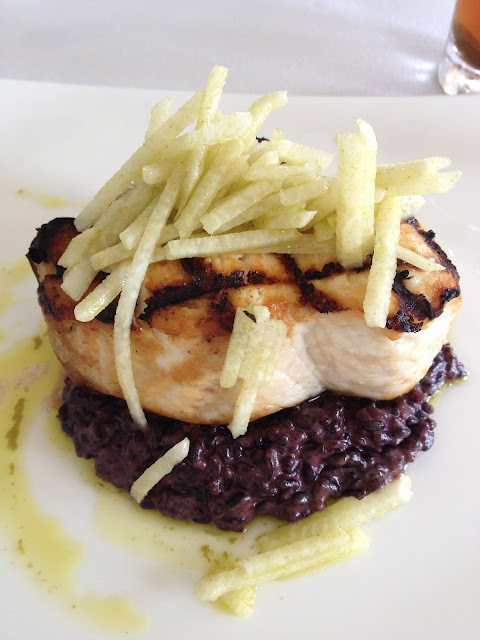 I ordered the Grilled Swordfish with Mango and Jicama Slaw with Cilantro, Lime and Coconut Forbidden Rice. The girls had chicken fingers and corn chowder and Sue ordered the club sandwich. Everything we ordered was outstanding. See the complete menus here. After lunch, we visited the calm OH! Spa which uses products, ingredients and scents reflecting the seasons. If you go, try the Fresh Lemon Scrub, a nod to Rhode Island's infamous lemonade. There is also an indoor 20-meter lap pool with windows facing the Atlantic and if you fancy golf, step outside onto the resort putting green. For a round of golf, nearby courses include Lake of Isles in North Stonington. Want to frolic in the ocean? Enjoy an afternoon on the private white-sand beach with cabanas, sea kayaks and paddle boards. Hungry on the beach? The Dune Cottage is available for light fare. Need more amenities? See the full list here. While the Ocean House is extraordinary in the summer, I would imagine that the hotel is just as dreamy in other seasons. With fireplaces situated around the hotel, curling up with a good book and a cup of tea while watching the Atlantic Ocean waves would be lovely on a drizzly autumn or winter's day. 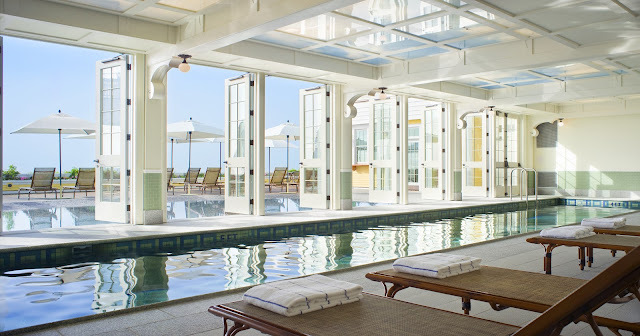 Watch Hill's Ocean House rates as a top Happy Place because when you want to feel pampered on the beach, there is no better place to do this than a resort that your grandmother would have said was "in good taste, darling." Want to learn how to make the perfect martini? Every Wednesday at 4pm join the Ocean House head bartender in the Club room as he teaches guests "How to Make a Mean Martini"